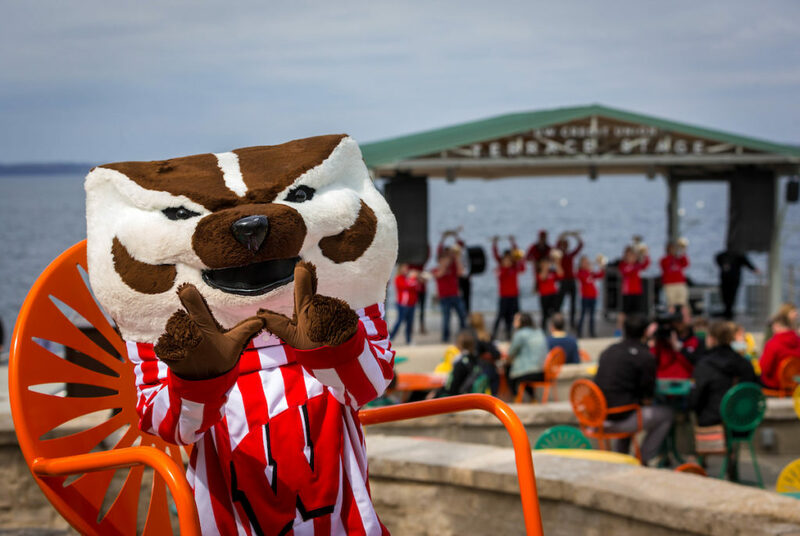 Bucky Badger poses for a photo while the UW Marching Band performs on the Terrace stage. We get it, seniors — you’ve made it this far, all you’re looking for now is a straight shot to graduation. But you’ve still got time to experience at all the fun stuff available at Memorial Union and Union South. We’ve come up with the ultimate bucket list so you can toss that mortarboard with no regrets. Sometimes scrolling through Netflix to find the perfect movie takes more time than actually watching it. Luckily, Union South’s Marquee plays your favorite films, new and old, all for free. So sit back, relax, and enjoy the show. If you think you don’t love or “get” art, the art galleries in both Memorial Union and Union South will change your mind — take a stroll through the exhibits filled with local, national, and international artwork. Student play a game of pool at the Sett Rec during Sunburst Festival. 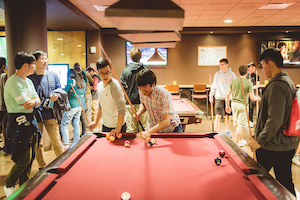 “Sett” yourself in the perfect place for some competitive fun with a game of billiards or any of the free table games at Union South’s Sett Recreation. It also features an eight-lane bowling alley as well as a two story rock climbing wall — and we believe you can make it to the top. Feeling bold? Come to Open Mic Night on the Memorial Union Terrace, where you can perform music, poetry, and comedy. Not looking to get on stage? Come for live entertainment and laughs. Calling all foodies! Discover all of the eating options the Wisconsin Union offers. Oh, and make sure to have some Babcock Ice Cream at one of our Daily Scoop locations. If you’ve never tried Orange Custard Chocolate Chip, then what are you waiting for? Get in touch with your creative side at Wheelhouse Studios in Memorial Union. Maybe you’re a pro painter, or maybe you’re a first time artist. We’ll only judge if you don’t come try it! Get inspired with a talk, listen to great music, or enjoy a play at the Wisconsin Union Theater. Even better, most student tickets are only $10. Hoofers Outing Club members out on the water. Have you ever wanted to go snowshoeing to Picnic Point? Keep a stand up paddle board afloat with your seven closest friends? 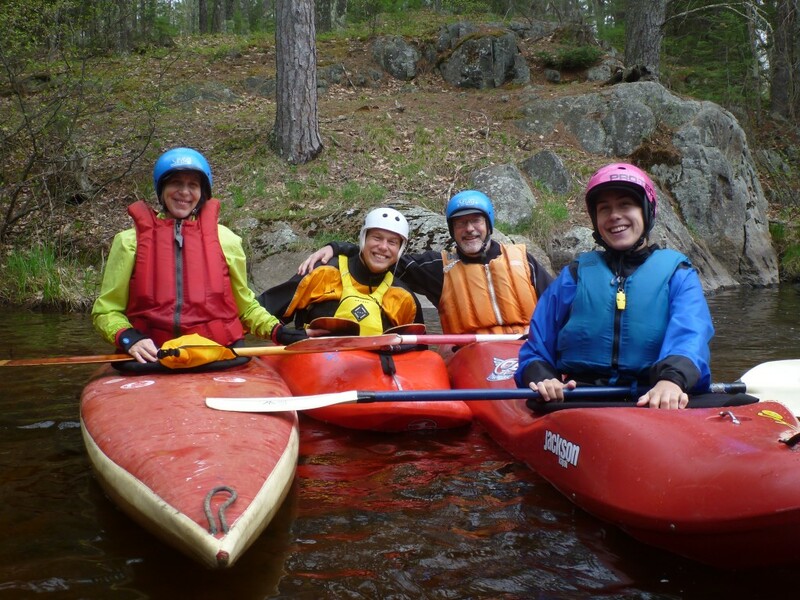 Take advantage of discounted equipment rentals for outdoor activities, whether in the snow or on the water. Maybe you can’t accomplish everything on this list by the time you graduate. (Though, we certainly hope you try!) But, good news — buying an annual membership after you graduate will allow you to keep access to all of this, and bring a piece of the Wisconsin Union with you wherever you go. Remember, while you are a UW-Madison student, you are a Wisconsin Union member with access to these and more experiences for a lifetime. If you’d like to learn more about your membership and about how to continue enjoying these benefits after graduation, please visit union.wisc.edu/membership.